You know that runny nose you get, the fever you get with an infection or the heat and redness at an injury site? All of these are reactions of the immune system, and more specifically the lymphatic system. My lymphatic drainage massage for the head and ears are popular views on my YouTube Channel (MassageByHeatherW) and I wanted to introduce you to lymphatic massage on the abdomen and trunk. Bloating, edema or swelling in the abdomen, a feeling of fullness or constriction all signal an overabundance of lymphatic fluid in the trunk and abdomen. This technique can help reduce that swelling and fullness and will also pull fluid up from the legs and feet if you experience swelling there. It’s All About the Breathing. Seriously. The most important piece of this self-massage routine is covered in the first video: lymphatic breathing. It’s a very specific kind of inhalation and exhalation designed to use the movement of the diaphragm and lungs to encourage drainage of lymph from the trunk and legs back up into the main thoracic lymphatic duct and the subclavian vein at the neck area. There’s a simple rule for it: Belly First. On the inhalation and exhalation the belly goes first. When breathing in, breath into the belly first, and expand the abdomen as much as you can, then pull air upward into the chest, filling the upper thoracic area. Once you’ve finished inhaling, exhale from the belly first. Release air from deep in the lungs and feel your belly fall until it’s empty, then release air from the upper chest/ribcage. Remember, Belly First on inhale and on exhale. This method of breathing is incredibly successful in reducing edema, swelling and fluid retention in the trunk and abdomen. It seems too good to be true, but it’s as effective, if not more effective at pulling fluid from the trunk than what we’ll cover in the second video, which will be manipulation of abdominal area. As with all lymphatic drainage massage, there are contraindications. While it is a light form of massage, it is very powerful and can have a broad effect on the body. Note that if you are pregnant, you can safely perform the lymphatic breathing routine (this first video), but should do perform the routine in the second video where there is manipulation of and pressing down on the abdomen. 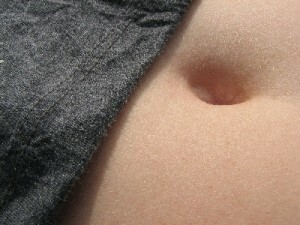 Contraindications specific to the abdominal routine are abdominal aneurism or thrombosis/phlebitis. As always, massage in Louisville in Saint Matthews and in Nashville in Brentwood available if you’d like to try these techniques out in your next session. YES! This will absolutely help fluid in the legs. The lymphatic system is a fluid dynamics system, that means that for the fluid to move, it needs to have someplace to go. Fluid from the legs goes up into the torso, which you are directly affecting using the abdominal massage lymphatic work. Make sure you also do the neck and breathing too, as those two lymphatic techniques make a HUGE difference in fluid coming up out of the legs. I have self-lymphatic for the legs on my to-do list, but haven’t gotten to it quite yet. To do work directly on the legs, you can pump very lightly at the groin crease (on the leg, directly below the crease with your torso, close in to the pubic area. Just pumping there will get fluid moving up out of the legs. Good luck and let me know how it goes!